12. Thread arming wire through two Fahnstock clips and the bottom of the fin; vertically align arming wire with arming wire slots located on gag rod arming wire housing (FMU-139A/B) (fig. 13-5). 13. Push arming wire into arming wire housing. 14. Remove safety pin from gag rod. Assembly of BSU-86 and BSU-85 Fins to GP Bombs Inspect the BSU-86 fin (fig. 13-8) as follows: 1. Inspect fin for damage and improperly in- stalled or missing parts and corrosion. 2, Ensure that the restraining band is free of corrosion. If damage is found or suspected, complete steps 3 through 7; if no damage, proceed to step 8. 3. Remove cotter pin from fin latch; ensure latch opens freely. NOTE: If fins extend automatically at least 1/2 inch when the cotter pin is removed, and can be extended to contact the shock absorber by hand, the fin is operative. 4. Check that link pins and link pin retainers are present, not damaged, and properly positioned in the drag links. 5. Close fins and clamp together with vise grip pliers. 6. Relatch the release band, and insert warning tag assembly. 7. Remove vise grip pliers. 8. Ensure band, retainer, and release assembly are not damaged. 9. Ensure the lanyard swivel is installed on stowage. 10. Ensure the release lanyard and housing and the safety clip are not damaged. 11. Ensure the slotted spring (roll pin) is installed and is properly seated and not protruding from the clevis. Inspect the BSU-85/B fin (fig. 13-9) as follows: 1. 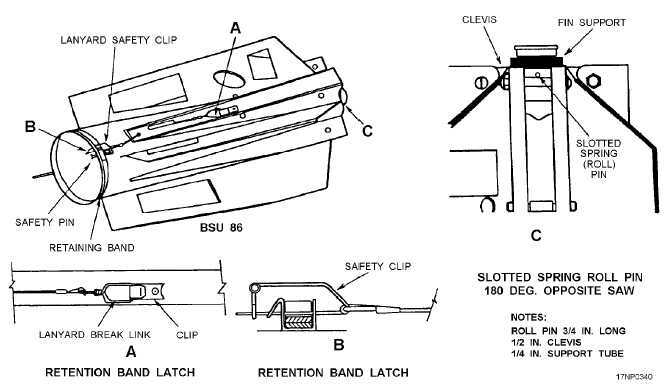 Ensure safing pin assembly, safety latch pin, and lanyard clip are properly installed. 2. Ensure all setscrews are installed and flush with inside surface of the forward ring. 13-8 Figure 13-8.BSU-86 bomb fin.